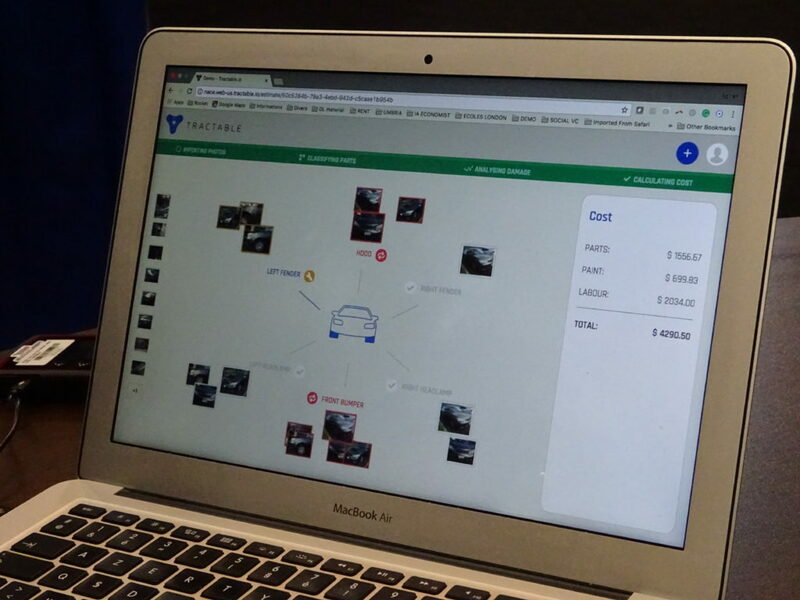 Some of America’s Top 6 insurers are already testing Tractable’s artificial intelligence photo estimating system — technology which could possibly replace human desk review on up to 70 percent of auto collision claims, according to the company’s founders. Tractable’s AI can identify individual exterior auto parts from photos and classify each part’s damage as repairable, replace-only or unscathed. “Computers can now see better than humans,” he said. To achieve this breakthrough, a computer needs to be trained through techniques including what Cohen called “supervised learning.” Feed the computer numerous images and tell the computer what it’s supposed to learn from that image. For example: This photo shows a bumper, and “you should replace it when it’s damaged like that,” according to Cohen. “If you show the computer enough data, then it gets it,” he said. Tractable’s computer has seen hundreds of millions of images and the corresponding estimates, according to Cohen. Cohen said “a big part” of the computer’s photo library came from Mitchell during a partnership announced in 2016. But several top carriers from the U.S. and Western Europe also supplied photos along with corresponding estimates. And more images and estimates come in all the time, he said. “We use that to train the machine to behave like an expert,” he said of the company’s data set. The computer has seen so many examples of damaged parts paired with estimate details of what done to fix with those parts that it knows what’s likely to be needed on similar damage in the future. 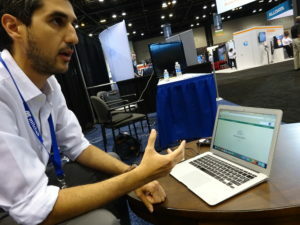 Cohen showed a demo during our interview at NACE. He entered the VIN so the computer could pull replacement part prices, and asked the AI to appraise the bumper cover, headlights, fenders and hood. The system quickly sorted through a bunch of images of the damaged Honda and grouped all the photos of the selected six parts into separate piles. Anything not classified as one of those parts was discarded. It then quickly categorized the parts as repair, replace, or leave alone based on a severity score of the scratches and more serious damage. “It’s starting to behave like an expert,” Cohen said. In the demo, the Honda’s bumper cover and headlamp were flagged for replacement. “Any car model, it works,” Cohen said. The photos can similarly be taken under different lighting conditions. He demonstrated it on another car, which quickly sorted through 25 photos and “Boom, it’s done.” Parts were similarly classified as repair, replace, or good to go. We pointed out that one photo showed that a shop or another party had written the word “Gap” on the car and drawn arrows indicating part of the gap between the fender and door. Clearly, a shop or adjuster had pointed out an issue that wasn’t being caught by the AI. In that situation, “you want more photos,” he said. The AI would call the part repairable, he said, but a repairer could request a supplement and submit more images to justify it. While recognizing and scoring the damage on a severity scale draws heavily from the database of images and estimates, Tractable pairs it with a set of business rules “which is not AI,” according to Cohen. This non-AI set of rules also allows Tractable controls for significant year-to-year or design generation changes, he said when we suggested that the computer’s vast understanding of steel Ford F-150 claims and photos became virtually useless as a knowledge base for photo-estimating the new aluminum trucks. Tractable ensures quality control by measuring the agreement rates between experts on the extent of the damage. It also has a body shop engineer full-time on its staff. “I think that makes us very different,” he said. The company’s ability to be vehicle-agnostic, granular, and not rely solely on past estimates to calculate future repairs set it apart from competitors — not to mention its mountain of data and its ability to clean that data “so it doesn’t learn the wrong things,” he said. 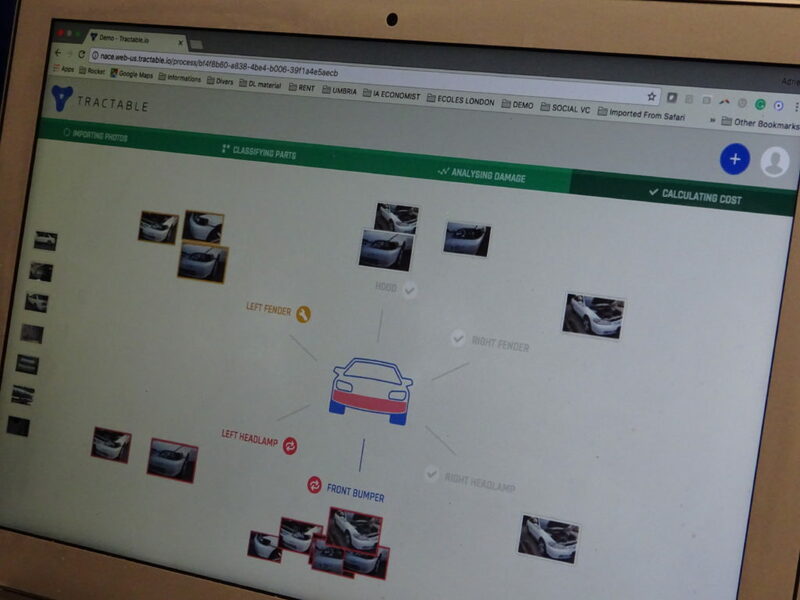 Tractable sees its technology as applicable to the 20 percent of total loss claims and the 50 percent of estimates which involve simply exterior parts, according to Cohen. “You could settle the claim in minutes,” he said: The system sorts through the photos, runs antifraud checks, and pays out immediately. 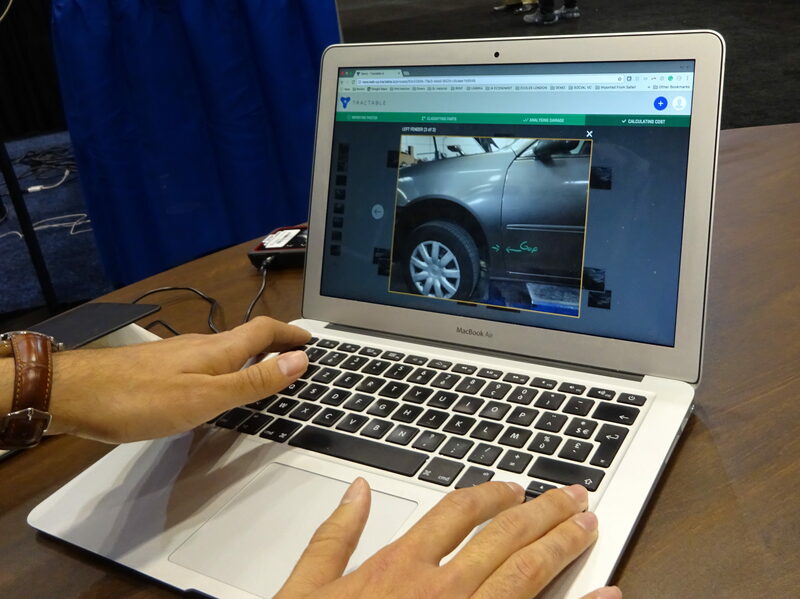 This is similar to what the company Lemonade has proposed for homeowner’s claims, and its customers love it, CEO Alexandre Dalyac said last month at TU-Automotive’s Connected Car Insurance summit. “I think this would completely change the claim experience,” Cohen said. The other 30 percent involving more complex claims, such as structural work, would be kicked over to an actual human being, Cohen predicted. The beauty of Tractable system is that it controls for adjuster inexperience or even bias to underestimate claims, Cohen said. Tractable said that insurers want “consistency” and “accuracy,” and repairers want speedy approval so they can fix the car. This satisfies both sides and removes the tension by having the neutral AI make the call, he said. Dalyac told the TU-Automotive the company can generate $40 in value per claim for a potential billion dollars in value to insurers in the U.S., he said. Cohen said the first Tractable product was on the market today, with some of the Top 6 insurers using and testing the technology. Dalyac in September described the company as having 2-3 of the Top 6 on board and would have half of the Top 10 insurers on board by the end of the third quarter. Tractable as of our July 2017 interview had also raised more than $10 million to date in investments from parties including former executives from companies like Microsoft, Facebook and Google, AXA and Zurich, according to Cohen. “All the big names are really betting on us,” Cohen said. The initial product being tested in the U.S. right now merely classifies parts as repair, replace or undamaged, according to Cohen. The next product will begin to calculate repair costs, and while “we can’t share” a timeline, technology moves fast and an announcement could be soon, he said. Cohen said that Tractable would ultimately like to produce an estimate, but this might only include “the big buckets” — part costs, labor hours, labor rates — rather than be granular and carry line items for every single operation like today.